There’s a huge audience for stories that involve characters who solve problems using wit and intelligence rather than force and physical strength, particularly in written fiction. Part of this, I suspect, has to do with the fact that the audience for written fiction mainly consists of people who enjoy and spend time reading books, which is usually seen as an intellectual pursuit. People who read books for entertainment are usually the kind of people who identify more with Bruce Banner than with Hulk. We’d like to solve our problems by being clever and adroit, rather than transforming into a giant green monster and solving our problems by smashing them. We have an easier time empathizing with characters who are like us, and a story about character who solves problems using the same skills that we possess feels validating. The issue is that there are a lot of situations where Hulk is better at solving problems than Bruce Banner, and if you want to construct a story where every problem can be solved with wit (and no problem can be better solved with brute force), then you’re going to have to warp the events (and sometimes the logic) of the story in the service of that goal, because that’s not always the way the real world works. And a lot of times, this has the effect of making stories more about using a very narrow idea of intelligence, rather than actually approaching problems rationally. One of my favorite examples of this comes from a scene in the movie Sneakers (a delightful 1992 thriller and heist movie about cryptography and espionage) where Robert Redford’s character goes to steal a cipher device from a researcher’s office. After socially engineering himself past the front desk, he finds his caper brought to a halt when the door to the office is protected with an electronic keypad. He radios the guys in the surveillance van and says, “Anybody remember how to defeat an electronic keypad?” Because this is a thriller about computers and cryptography, we expect them to come up with some kind of backdoor solution to breaking this lock, the cyberpunk equivalent of “recite this magical incantation and the lock will open for you.” The audience waits in tense silence as Robert listens to the voice of the computer guys speaking into his earpiece and mutters to himself, “Alright, that might work.” And then he takes a step back and kicks down the door. This is what actual intelligent problem-solving actually looks like. In this scene, the crew identifies the fact that when snooping around in an old academic research building, it’s easier to kick an old wooden door off its hinges than to try and defeat an electronic keypad. They do the smart thing, which in this case is to use physical force. And I (and most viewers) are delighted by this moment, in part because you see the thought process behind it: Robert Redford encounters a problem, asks the computer guys to solve it for him, and they realize that real problem is not “How do I hack this electronic keypad,” but “How do I get to what’s on the other side of this door.” This moment of hesitation is important, because if he had just marched up to the door and kicked it down without taking the time to consider the optimal solution, he would feel less like a smooth operator executing the perfect heist, and more like a Jack Bauer who just charges into situations and resolves them with force. It can be easy for stories to fall into the trap of breaking things down into a dichotomy of “brains vs brawn,” as if any energy spent doing physical tasks subtracts from the energy that would otherwise power your brain, but in fact a lot of the times the smartest thing to do is to punch the bad guy, or kick down the door. The dichotomy of “brain vs brawn” suggests that these two are somehow mutually exclusive, and it feels like an example of a common fallacy where people see real-life skills and talents like some kind of tabletop RPG stat sheet where you have a finite number of points to distribute, which means that any points invested into things like charisma and strength necessarily subtract from stats like wisdom and intelligence. In reality, “talent” is not an evenly distributed thing; at best, it seems like athleticism and intellect are orthogonal, as plenty of people seem to have both in great abundance. (At my high school, the class valedictorian was also a star player on the high school baseball team.) There are also lots of smart people who have realized that investing time in their health and fitness is a smart use of their time, and usually the most fit people are the ones who treat optimizing their health as a worthwhile undertaking. In fact, there’s plenty of evidence that physical fitness and mental performance are positively correlated in a number of ways: for example, cardiovascular health affects brain function, and so engaging in physical exercise increases your mental fitness, rather than draining away a finite number of stat points from intelligence to boost your physique. Kicking down the door may be intelligent, but it does not always live up to the romantic ideal of intelligence, which is less about actually making the best choice in any given situation, and more about believing “reading books is a better use of your time than sports, scientists are always better at solving problems and winning conflicts than linebackers.” This partly feels a bit like concession to the fact that the crowd of people who read for recreation tend to be the same kind of people who spent much of their youth indoors reading books rather than flipping tires on the football field, and people like reading stories that serve and flatter their own sensibilities. But to be charitable to this line of thinking, it is true in the aggregate that people who engage in intellectual pursuits tend to do better: education is correlated with things like higher income, longer lifespan, most of the things that we’d define as “higher quality of life,” and more generally, “winning.” The issue is when you take that general idea (“the person who had a good SAT score tends to have a better life outcome than the person who spent high school playing sports associated with head trauma”) and try to apply it universally to every situation, you wind up in bizarre situations where people would rather try to hack the keypad instead of kick down the door. The convenient thing about fiction is that the author can simply fail to introduce the sort of problems that would be best solved by a well-placed kick. (If you want to have a story about hacking the electronic keypad lock, just make the door out of some kind of reinforced material that can’t easily be kicked down.) In fact, it’s possible for an author to create an entire setting based on the idea that people who are more intelligent (here defined as “reading lots of books”) always win. I suspect that a major reason why “kid goes to wizard school” is so popular as a trope of fantasy that is that it’s essentially created a genre where studying and reading books makes you more capable of dealing with violent conflict. In general, bookish and studious people rarely intersect with violence, and when they do they tend to find their skills poorly matched for dealing with violent conflict, but a wizard school setting allows for a logically consistent story about a character who is a brainy academic who also solves their conflicts with with superior force. In this case, we don’t have to choose between being Bruce Banner or being the Hulk. The wizard doesn’t have to trade their intelligence for strength; the wizard becomes a powerful combatant by burying their nose in books. The issue with a character who solves their problem just by studying is that when they acquire that skill and then apply it to solve a problem, they’re not really demonstrating intelligence, they’re demonstrating expertise. The wizard’s power appears to be the triumph of brain over brawn, but this is true only in the most superficial sense of what is meant by “brains.” A wizard who defeats his enemies by throwing fireballs at them is not really showcasing his intelligence, even if his method for learning to throw fireballs involved reading a lot of books. Intelligence is powerful because it transcends expertise within a single domain. It’s also narratively useful, because it would feel unrealistic for a character to be an expert on every single problem that they encounter. You can mitigate this somewhat by creating a story about an ensemble cast of experts who are capable of dealing with anything that comes at them (which is the level on which heist stories like Sneakers operate), but there’s something about the ability to solve a problem in a simple and elegant way that just sings to us, precisely because it bypasses the need for expertise. You could spend hundreds of hours studying this field to become expert enough to overcome problems in the conventional way, or you could be clever, think outside the box, redefine the problem into terms that you’re equipped to deal with, and kick down the door. Last week, Atlas Obscura published an article by Anne Ewbank titled Why do Fantasy Novels Have So Much Food? This article provides many interesting examples and discusses the role that food can sometimes play in fantasy, but I don’t feel like it really answers the question posed by its title: why do fantasy novels have so much food? I’ll offer my own answer: immersion. As a fantasy author, I am constantly looking for ways to provide description that engages all five senses. In most fiction, the vast majority of description is focused on what characters see, but if you really want to place the reader in a setting, it needs to feel tactile. When a character walks into a boggy marsh, I don’t just want to describe the tepid pools of water; I want to describe the pungent stench of rotting wood, and the texture of the soggy ground underfoot. It’s one thing for a character to remark on how hot and humid it is; it’s another to describe the feeling of the wet, vaporous air as beads of water are condensing on your skin and coalescing with your sweat. Food is great at engaging all five senses. Not only is it one of the few places where you get to talk about taste, but food gives off aromas. Eating food is a tactile experience: you can feel the stickiness of a sweet jelly as you lick it off your fingers. Food has a texture that you can feel on your tongue, and it feels different in your mouth depending on whether you allow it to slowly slide down your throat or stuff your cheeks with it. And kitchens are full of sounds that add richness to the setting: you can hear the crackling of a fire, the sizzle of a piece of meat dropped onto an iron cooking surface, the delightful shing of a carving knife being sharpened. You hear things at the dinner table, too: the delightful crunch of biting into a cracker, or the clattering of cutlery on plates. A baked pastry will make different sounds when you bite into it depending on whether it crust is hard or thin and flaky. Fantasy is often viewed as one of the most immersive genres, largely because it spends so much time on providing detailed description that not only tells you what is happening in the world, but giving you a sense of what it feels like to live in that world. This often means that fantasy novels are longer and slower paced, but one of the reasons that many people enjoy large fantasy tomes is that they enjoy the feeling of being transported and immersed in another world. If you were expecting a faithful adaptation, there’s a lot to take issue with. The movie is more about emotions and revenge, rather than logic and justice as the manga/anime was. “Light” and “L” are definitely not the characters that people were expecting coming from the anime/manga. I don’t really consider myself a “purist” when it comes to adaptations, and I would actually be okay with the decision to tell a story about emotions/revenge rather than logic/justice if it were done well, but it’s not. Even when people behave “irrationally” and are driven by emotions, there’s a limit to how much stupidity you can tolerate. The biggest example is how Light never makes any attempt to hide the death note, even after L just told him face to face that he believes Light is Kira. I don’t expect Light Turner to be as smart/prepared as Light Yagami (who devised a way to hide the death note in a hidden desk drawer way back in episode 2, before the investigation ever started), but you would think that after L tells Light Turner “you are the prime suspect,” he would at least devote a little thought to hiding the murder weapon. This reminded of a scene from the anime, where the investigation team is watching Higuchi (the Yotsuba killer) as he goes through some files to discover Matsuda’s name (the file he actually finds is a decoy with an alias, planted by the police). Higuchi pulls out the death note and writes the name down, and the first response of the investigation team is, “Wait, why isn’t he killing him? Why is he just writing the name down? Is he just recording his name to kill him later? But why would he do that when there’s such an urgency to kill him?” It’s not until Higuchi starts screaming “Why won’t he die?” that the investigation team deduces that perhaps writing down names is Kira’s method of killing. My biggest gripe with the movie is how it feels like Light is stripped of any sense of agency. It was one of manga/anime Light’s defining characteristics. Light Yagami was smart, ambitious, ruthless, but most of all, he was proactive: the plot of the anime advances at a rate according to his choosing. It is Light who chooses to pick up the death note after seeing it drop from afar, it is Light who chooses to write the first name down to test the death note’s powers, it is Light who decides to start writing hundreds of names in the death note without any outside prompting, it is Light who decides to kill Lind L. Tailor, it is Light who chooses to kill the twelve FBI agents, it is Light who chooses to turn himself into the police to set things into motion to kick off the “Yotsuba” mini-arc, and so on. In the anime, Light is a character who does things. In the movie, Light is a character who has things happen to him. In the movie, Ryuk basically “chooses” Light by dropping the Death Note right next to him when no one else is around. It almost feels like Light Turner is tricked or coerced into using the death note by Ryuk, who tells him, “Go on, if my appearance seems unbelievable to you and you think this is all a dream…why not try writing a name down?” Even if Ryuk wasn’t actually trying to mislead Light, consider this: when a supernatural nightmarish being that surely has other powers (such as the power to inflict death) descends upon you and makes a strongly-worded suggestion that you do something, can you really say that you chose to do it of your own volition? Lest we’ve already forgotten, anime Light started writing names down well before Ryuk showed up. In fact, when Ryuk does show up in the anime, he’s impressed that Light has managed to fill five pages of the death note, already having killed hundreds of people. Light Yagami seems barely fazed by Ryuk: Light drives the action, and Ryuk is just along for the ride. In the movie, it feels like Ryuk is the one who drives the action at the start, and Light Turner is just the person he decided to drag along for the ride. To put it into Campbellian terms: Light Yagami steps across the threshold entirely of his own volition. Light Turner is dragged across the threshold kicking and screaming. Literally. A few years back, fantasy author Brandon Sanderson (Mistborn, Wheel of Time, Stormlight Archive) wrote a series of essays describing laws of magic systems. In the second of these essays, Sanderson posits that limitations are of greater importance than powers when it comes to effective magic systems. This notion is in agreement with a basic storytelling principle that I think many of us (readers and writers alike) instinctively understand about storytelling: what a character can’t do is often more interesting than what they can do. Limitations and weaknesses are what drive struggle, vulnerability, conflict, and tension, many of the wonderful elements we love to see present in a story. As a bit of an aside, I believe that this is why there is some disdain for for “wish fulfillment” and “Mary Sue” type characters, as these are narratives that are often inspired (and defined) by what the characters can do, often to the complete exclusion of any limitation or weakness. It’s common to define and recognize magic systems based on powers. A prominent example of this can be seen in the anime/manga series Death Note (spoilers follow). The main magic present in Death Note is a notebook that has the ability to kill people, and protagonist Light also has the ability to specify the victims’ time and cause of death. These are interesting story hooks. But I would contend that Death Note is not a story about the powers of the Death Note as much as it is a story about the Death Note’s limitations. What are the limitations of the Death Note? For one thing, Light needs to physically write the name of his victim in the book in order to cause death. He can’t just will people to die, or cause people to die by performing some trivial action like snapping his fingers. The Death Note, by its nature, leaves behind a paper trail, and thus represents a liability for anyone under scrutiny of investigation. Thus, when his home comes under surveillance, Light is forced to come up with creative ways to continue to write names in the Death Note while avoiding detection. In a sense, Light’s continued use of the Death Note is requisite, in the sense that if people stop dying when he is under scrutiny, then it becomes apparent to the investigation team that Light is somehow linked to the murders. This limitation of the Death Note represents a manner in which Light may be caught. It’s a source of tension. The other major limitation of the Death Note is that Light needs a name and face in order to kill. This is ultimately what drives the conflict between protagonist Light and antagonist L, as Light cannot use the Death Note to eliminate L without knowing his name. This limitation of the Death Note also forces Light to creatively to circumvent this limitation, as becomes the case with the Raye Penber arc. Death Note also provides a good example of a magic that is tied to a powerful cost. Light has access to another magic power apart from the Death Note itself: the “shinigami eyes,” which allow the user to see someone’s name by looking at them. However, this power comes at the cost of half of his own remaining lifespan. Light decides not to trade half his remaining lifespan for the shinigami eyes, which reinforces what we are taught about Light during the series: first, by declining the offer, he is demonstrating a certain level of pride, or confidence in his own ability. The ability to see someone’s name simply by looking at them is a potent power that would greatly advance Light in the pursuit of his immediate goals, but he’s confident that he is skilled enough to defeat his foes without resorting to this costly power. Second, Light’s decision to decline the shinigami eyes reinforces the idea that Light’s mission to eliminate criminals isn’t ultimately driven by altruism, but by megalomania. Light doesn’t consider it enough to simply create a “better” world that is free of criminals; he also wishes to preside over this new world as emperor. Making the trade for the shinigami eyes would allow Light to more quickly overcome the immediate obstacles in his path, so Light is forced to make a decision: does he take the eyes and achieve his vision of a “perfect world” that much sooner? Or does he decline the eyes and give himself more time to sit on the proverbial throne? He opts for the latter, and that is a powerful statement about his character and true motivations. Later in the story, we see other characters who also receive the offer to trade half their remaining lifespan for the shinigami eyes. And each of those characters, in turn, reveals an element of their character and motivations based on the decision that they make. The conflict between Light and L is one of the most interesting parts of Death Note, and if Light had the ability to see others’ names, that conflict would end quite swiftly. However, because the power is tied to a significant cost, it can be included in the story without undermining that central conflict. Limitations are what drive the conflict of Death Note: Light must continue to write names in the Death Note without alerting the investigation team that is monitoring him, and Light must also ascertain L’s true name. Without these two limitations in Light’s magic power, we don’t have much of a story. With them, we have a manga that has become one of the most successful manga of all time, running for 108 serialized chapters, selling over 26.5 million copies, and receiving numerous accolades. A story with fantasy elements doesn’t necessarily require detailed rules defining the limitations of the powers that exist within its universe. But if you want to tell a story that is about conflicts based around magic powers, a good first step would be to consider what the limitations of those magic powers are. The “VN” abbreviation should be relatively common and intuitive for those familiar with visual novels, and it’s common to see it employed for the sake of brevity. “OEL” is a bit of an oddity, though. The earliest usage of the acronym OEL is to refer to “OEL manga,” or “manga written in English (by non-Japanese authors).” However, by commonly-accepted definition of the word “manga,” this alleged “OEL manga” is not truly manga at all. “Manga,” being the Japanese word for “comics,” is used outside of Japan to refer to Japanese comics, and to use it to describe non-Japanese works is misleading. (Non-Japanese comics, according to that commonly-accepted definition, cannot be manga!) However, because “manga” is hip and trendy among younger consumers while traditional western comics have struggled in recent years to reach a younger audience, the fictitious term “OEL manga” was invented so that western comic book artists could market their works to fans of Japanese comics. Another reason to avoid the OELVN distinction for your own work is that it puts you into a smaller pool of works. Rather than being compared to visual novels (including those of Japanese origin), you are inviting users to place you in the same category as all those other projects made by English-speaking devs. For the unambitious, this may not be an entirely bad thing, since the current pool of non-Japanese visual novels is relatively starved for quality, and you may benefit more from a comparison to other works not particularly renowned for their quality. But do you really want your work to be associated more with the (sometimes negative) connotations that the term “OELVN” may carry? Do you want people to look at your work and say it’s “good for an OELVN?” Or do you want people to critique it as a visual novel, without undue regard for the original language? All that being said, I don’t expect the term “OELVN” to leave the vocabulary of the visual novel community any time soon. At this point, its definition is pretty well-established within visual novel communities, and it’s the most laconic way to refer to visual novels originally composed in English (as opposed to non-English visual novels which were later translated into English). However, those within the visual novel community may want to consider the connotations the term may carry before using it as the default term to describe certain works, especially their own. Technical flaws are often the items that receive the most complaints when a work is checked for quality, because they are the easiest to objectively identify. Certain kinds of technical flaws are readily apparent: incorrect spelling, bad grammar, poor use of punctuation. However, we can also holistically look at a brief passage of writing and identify it as “poorly written.” This is because there are certain usages of language which, while not technically wrong, are still sub-optimal. The door was opened by the man. The man opened the door. There is a preference for active voice in this case because it expresses the same idea with greater brevity and clarity. He slowly and lazily walked his way over to the building, looking at the front gate with an expression of boredom and disinterest. He sauntered to the building, casting a listless gaze at the front gate. Lower word count, same message. The word “quickly” is meaningless, as speediness is already implied by the word “ran.” If the word “ran” is not sufficient to describe the extent of her speed, another descriptive word can be substituted, such as “dashed” or “bolted.” Saying that someone “dashed” outside is much more exciting and engaging than saying that they “quickly ran” outside. Verbosity and length are not the same thing. Verbosity refers to writing which is needlessly lengthy. A better way to describe verbosity would be a deficiency in density of writing, rather than an excess of length. Good writing is dense, expressing as many ideas in as short a span as possible. There are two ways to achieve brevity: you can express the same idea in fewer words, as described above, or you can express more in the same length. Megan hated working in the park during the summer. She hated the sweltering, oppressive humidity. She hated the flies, drawn by the smell of summer barbecues and potato salad and human sweat. But most of all, she hated the masses of snotty-nosed children who paraded the park, filled with mirth and energy and a desire for the frozen dairy treats she peddled. Each sentence of this passage is multifunctional in that it develops both the setting and character. By the end of the passage, we should have a good idea of what the park is like during the summer, and also an awareness of how our character Megan feels about working there. I leaned back against the soft snow bank, letting the dry powder reshape itself around my weight. My skin had cooled to match the air around me, and the tiny pieces of ice felt like velvet under my skin. The sky above me was clear, brilliant with stars, glowing blue in some places, yellow in others. The stars created majestic, swirling shapes against the black universe-an awesome sight. Exquisitely beautiful. In your writing, look for ways that you can use certain passages to develop multiple story elements. (One way to do this is by leveraging viewpoint.) By developing multiple story elements in tandem, you can achieve more in your writing without needlessly extending the length. An overwhelming majority of visual novels are first-person narratives. Fewer than 1% of visual novels on VNDB are third-person narratives, and their influence is incredibly minimal. Some visual novels do occasionally shift narration to give the reader information about story elements outside the protagonist’s viewpoint, but the main storytelling approach chosen by most visual novels is for the reader to experience the story through the eyes of the protagonist. Part of this is by necessity and the nature of interactive storytelling. In many cases, the protagonist functions as the reader’s sole means of interacting with the story. Overwhelmingly, the reader’s influence over the story’s direction is limited to controlling the actions of a single character. Giving the reader multiple points of influence over the story is tricky business, and can lead to situations where the player interacts with himself more than the world of the storyteller. Setting aside concerns of interactivity, the “protagonist as proxy for reader” would appear to have advantages from a narrative standpoint as well. By treating the reader as story participant, rather than an observer, a piece of fiction can become more visceral and immersive, or so the argument goes. The modern approach to building the protagonist’s character likely has its roots in eroge, where the main selling point is the love interest(s), not the main character. Traditionally, the goal of these works is to create a protagonist that is nothing but a proxy for the reader, achieved my minimizing characterization of the protagonist. Often, this protagonist is faceless, both in the literal artistic sense and in the figurative story-focused sense. It’s pretty hard for a story to be interesting and compelling when your “main character” is the most boring character in the story. The main character, arguably, should be one of the most interesting characters in the book because we have the unique ability to see inside of his head. We’re exposed not only to his external behaviors and attributes, but also have the ability to read his inner monologues and see what he thinks. More importantly, the main character, as the reader’s “eyes” for the story, can provide us insight into his own character in less explicit ways as we are exposed to the manner in which he presents the world and events of the story. Most of us have had the opportunity to observe real-world examples of this: the man who constantly complains about his wife is in many ways telling us just as much about himself as he is about his spouse. When the character tells us about the world and narrates the events of the story, he also shows what kind of character he is as we are exposed to his presentation. The first person perspective, seen in this light, actually has two advantages: it can present more information, and it can present it in fewer words. Narrating the story from the main character’s perspective makes it possible to develop character and plot simultaneously. Having a protagonist without character squanders that opportunity. Saya no Uta (warning: wiki page contains spoilers) is an interesting case study because it breaks many of the unwritten rules governing visual novel protagonists, perspective, and storytelling. Addressing a point made earlier, Saya no Uta narrates from multiple perspectives. It has a “main character” or protagonist in Fuminori, but in its later acts certain portions of the story are told using third-person narration, mostly limited to Kouji’s perspective. One interesting part of this approach is that the reader actually controls actions from two different parties. The visual novel is written such that the reader’s ability to influence the direction of the story does not undermine the conflicts inherent in the story, large by limiting the degree to which the reader interacts with the story (there are only two decision points from start to finish). Saya no Uta also has a very abnormal protagonist. Fuminori’s warped senses are interesting because of the perspective that they give us. We are presented to the world not as it is, but as Fuminori sees it. Important to note is that Fuminori is not the reader. He is not a stand-in or proxy for the reader; he is his own character with his own separate motivations that the reader must identify ways to sympathize with. However, the fact that the reader is not an active participant within the Saya no Uta does not prevent it from being incredibly immersive. On the contrary, Saya no Uta is highly visceral, almost to the point of excess. Perhaps one of the most surprising things about Saya no Uta is that despite how uncanny Fuminori is (both in what he is and the actions he takes), he still remains emotionally engaging. Even in his most horrifying moments, Fuminori feels more human and real as a character than the majority of visual novel protagonists. I am not advocating that all visual novels become Saya no Uta. Saya no Uta is a story that is centered on perspective, and the main character’s aberrant nature is so pivotal to the plot that the story wouldn’t exist without it, making it relatively unique. However, it does teach a valuable lesson on how narrative viewpoints can be used to construct an effective story. It is still possible to achieve popularity and commercial success with a bland protagonist, as many bishounen-style visual novels continue to prove. 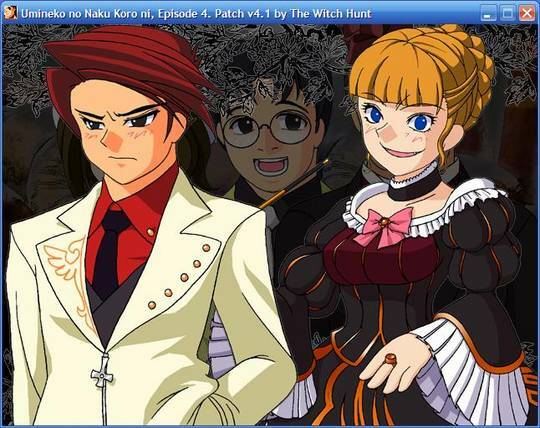 Fortunately, despite the cliche of the boring, faceless visual novel protagonist, there are many visual novels that have demonstrated the triumphs of creating a unique and compelling protagonist (many Type-Moon works tend to fall into this). Those seeking to evolve the medium and disrupt the market would do well to remember the valuable tool that an effective protagonist can represent. One of the things which I find most disappointing about the state of western visual novel development is that with overwhelming frequency, western visual novel developers choose to closely mimic the style of Japanese visual novels in terms of setting and genre conventions, as well as art style. High school romances (and all of the storytelling tropes associated with them) constitute the visible majority of visual novels in the west just as they do in the east. Many western developers have even chosen to use a Japanese high school setting (or facsimile thereof), apparently too daunted by the prospect of blazing trails unexplored by Japanese visual novels before them. To be fair, there are several regards in which western visual novels commonly diverge from their Japanese counterparts. Western-made visual novels tend to shy away from pornographic content, and oddly enough, also tend to cater to female audiences with greater frequency. Although female-oriented visual novels do exist in Japan, they are fewer and farther between, while it seems that female-oriented titles almost constitute a majority of western visual novel releases. The more female-oriented nature of the western visual novel market is, to some extent, the effect of a largely female-dominated development community. However, the market that these developers have cultivated is one which seems to be equally favor females, as evidenced by the commercial success of many western-made otome games. Although the unfortunate side of this becomes evident when it drives commercially-successful English novel developers to use Twilight for market research, it does suggest that western-made visual novels stand to reach an audience beyond the stereotypically male audience associated with Japanese visual novels and most electronic storytelling mediums. Certainly, the lack of pornographic content broadens the potential audience of western visual novels, and allows them to explore non-romance genres with greater ease. Yet, despite having the advantages of a much broader potential audience, most western visual novels have failed to break out of the niche genre utilized by the Japanese, continuing to retread the same tried and tested tracks already worn deep by previous visual novels. Western visual novel developers, conversely, tend to work with much smaller and more limited budgets, sometimes less than a hundredth the size of Japanese productions. Furthermore, the sale price of western-made visual novels tends to be much lower, generally not exceeding $20. Rather than relying almost exclusively on an otaku fanbase who are willing to pay inflated prices for products conforming to a specific set of expectations, the lower price point allows commercial western-made visual novels to reach beyond their “usual” audience to those who may have only a passing interest in most visual novel releases. The cost of visual novel production in Japan and the nature of the otaku market discourages tinkering too much with a proven formula, but western visual novels have no such restriction. A similar phenomenon can be observed in game development (mostly in the west, though not exclusively), where larger game studios tend to be more conservative in their production choices, resulting in less innovation in many cases, while smaller indie developers have the ability to take more risks and try out new ideas. Some indie developers even rely on novelty and innovation as a selling point, as it can be difficult to outperform high-budget studios when competing at the same game. Indie game development has become a more viable business proposition in recent years, in part due to the greater availability of development tools and digital distribution platforms. Fortunately, visual novel development already enjoys both of these advantages, arguably more so with regard to development due to the lower barrier to entry. Western visual novels should be more innovative, not less. They have the freedom to experiment and try new and ambitious things that could rock the foundation of the current visual novel community. Some ambitious flops are bound to result, but the consequences for failure are much less. Some interesting ventures have already been made in this direction, such as Digital: A Love Story, whose presentation is atypical to be sure. Although experimental works like this are currently but a small sliver of current western visual novels, I suspect it is western developers who will be blazing new trails and taking the medium in new directions as it matures. Hey everyone! So I guess I’m looking for advice on how to start assembling a small team of people who want to create an Indie game. I’ve got the writing skills, but I don’t have any artistic or coding skills whatsoever. I have no idea where to start in the process of working on an Indie game. I’m especially worried that I have no money to pay anyone with, so this would be strictly to see if we could cobble together a game and get it sold on a platform. At one point in time, I found this kind of post almost painful to read, but I’ve gradually become numb due to the frequency with which it repeats itself. The common train of thought behind this post can be likely be reduced to, “I enjoy video games, and believe myself to be a pretty good judge of what constitutes a good video game. I should get into game development!” This makes about as much sense as deciding to become a novel-writer because you enjoy reading fiction, or become a film director because of your love of cinema. Being an experienced consumer of content does not endow you with the skills required to create that content. Coding is so foundational to game development that making a video game without any coding ability or experience seems inconceivable. Trying to make a game without the ability to code is like trying to make a book without the ability to write. An illiterate person could create a book by dictating the entire contents of their book to a literate person who then transcribed it (or more simply, by hiring a ghostwriter), but this is infeasible for a number of reasons. First off, no one would be willing to do this for you without the offer of a sizable chunk of cash, which it doesn’t sound like you have. Time and effort are much more finite than ideas, and your idea isn’t any more enticing than any of the other ideas out there. Secondly, much of the process of creating a book comes through the process of internalizing your ideas as you transcribe them, and then re-iterating it so that it flows better. Implementing your game idea through code allows you to understand, internalize, and critique it better in the same way that writing your ideas out on paper allows you to be a more effective writer. By the finished product is time to publish, it may no longer be yours. Further, the experience (and skill associated with it) will go to the person who is doing the execution, i.e. not you. Visual novels, on the other hand, require little to no programming. Ren’Py allows you to create visual novels with scripting so simple that I can’t think of a metaphor to adequately describe how simple it is. At the same time, Ren’Py is powerful enough that, if you’re feeling ambitious enough, you can inject traditional game elements into it. Simulation games and RPGs have been built using Ren’Py. As an added bonus, after creating a visual novel in Ren’Py, you might just find that the process has taught you enough Python that you can begin coding an actual video game using Pygame or the like. If even that is too much for you, NovelStream allows you to create visual novels using a graphical user interface with zero scripting. It’s hard for a game, particularly one with low production value, to stand on its writing rather than its art direction or game design. Studios like BioWare are lauded for their storytelling ability, but the effectiveness of the narratives woven within modern games like Knights of the Old Republic and Dragon Age is also in part due to their production value. There’s more to BioWare’s storytelling than just writing. Further, there are many examples of games, especially indie titles, which are virtually devoid of writing. Games like Super Meat Boy demonstrate that writing can be an entirely dispensable element. Even narrative-heavy examples like Bastion depend at least as much on good art direction and presentation as they do on writing. In light of that, demand for writers among indie game developers tends to be lower than the demand for a programmer or a good art designer. Thus, when attempting to join game development projects, you will likely find yourself at a disadvantage. Writers will, at most, be one required part of the team, along side those who produce code and assets. It’s hard to make yourself valuable as a writer. There are a few scant examples of games whose existence is justified solely by their writing, but these are few and far between. And interestingly, many of these titles (Planescape being the most notable), often crop up in discussions among the visual novel community with frequency that suggests that if your aim is to recreate Planescape, the medium to do so might be a visual novel, rather than a conventional video game. The the first episode of Umineko sold out within 30 minutes of its debut at Comiket 72, and the series has since spawned a manga series and drama CDs, as well as a 26-episode TV series. To call Umineko “successful” would be putting it lightly. One would presume that the success of Umineko is due to the writing, as the quality of the assets and other aspects of its presentation certainly didn’t do it any favors. When people tell me their game ideas, usually their idea is 99% setting and story and only 1% gameplay. I have to tell them that they don’t have a game idea—they have a story idea. A game design is not a story design. If you want your idea made into a game, you’ll have to fill out the details about how the game actually plays—what the player actually does, how he moves his character, how he interacts with the world. Looking at games that are lauded for having immersive universes, such as Half-Life and Skyrim, the most interesting thing about these universes isn’t their content so much as how you are able to interact with it. Take away the interactivity, and you no longer have a game. The significant thing here is that the interactivity is the main draw for games, and the interactivity is not writing. Writing often wrests control out of the hands of the players to tell its story, as is often seen in the case of cutscenes. Some games try to disguise or hide this fact by offering nominal (fake) interactivity in the form of quick-time events. And players hate them for it. The point is that in order to make an effective game, your idea should be optimized for interactivity. And odds are that if your main concern is effective story, you will wind up with ideas that optimizes for that instead. Visual novels, much unlike games, often offer very little interactivity. As an extreme example, Saya no Uta, despite being several hours in duration, offers the player only two decision points during the entire course of the narrative, a stark contrast from a game like Civilization where I expect to interact with the game hundreds of times per hour. Some visual novels offer no interactivity and are completely linear, one Key example being Planetarian. So, you’ve decided that in spite of your lack of ability to program or produce assets, you’re going to create a game development team. The question then becomes: who can you get to join your team? Answer: probably not good game developers willing to work for free. “Developer” tends to be a profession with relatively high demand, and a correspondingly high market value. $50 per hour is on the low end of what you can expect to pay a freelance developer. Similarly, good artists expect to be paid for their work. When it comes to art, there’s a wider spectrum “acceptable” qualities (and prices to go with them), to get a good idea of what’s available, browse around the Deviant Art jobs forum. Perhaps the most distressing part of this process is that, as discussed above, while writers can be dispensable parts of game creation, developers are not. Without someone to code your game, you will, at most, be developing the idea for a game. Your involvement in the process is contingent entirely upon the participation of others. Creating a good visual novel still requires a sizable chunk of time and effort, not to mention skill in storycrafting. However, unlike game development, visual novel development is something that is achievable for many people with the resources immediately available to them. In a visual novel development, the most essential participant in the development process (and oftentimes, the person who invests the greatest amount of time) is the writer. You may choose to recruit an artist or a general engineer along the way, but recruiting other people for your project is non-essential. You can do it alone. And you can do it now. Want to get updates about what I’m working on? Sign up for my mailing list. I’ll use this to announce big things, like when a game I worked on comes out.